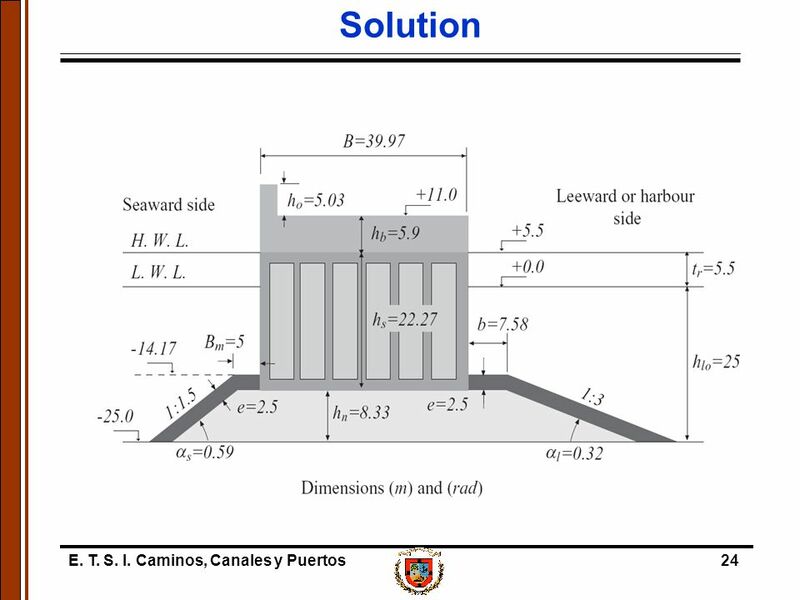 E. T. S. I. Caminos, Canales y Puertos1 Part 0 Engineering Computation. 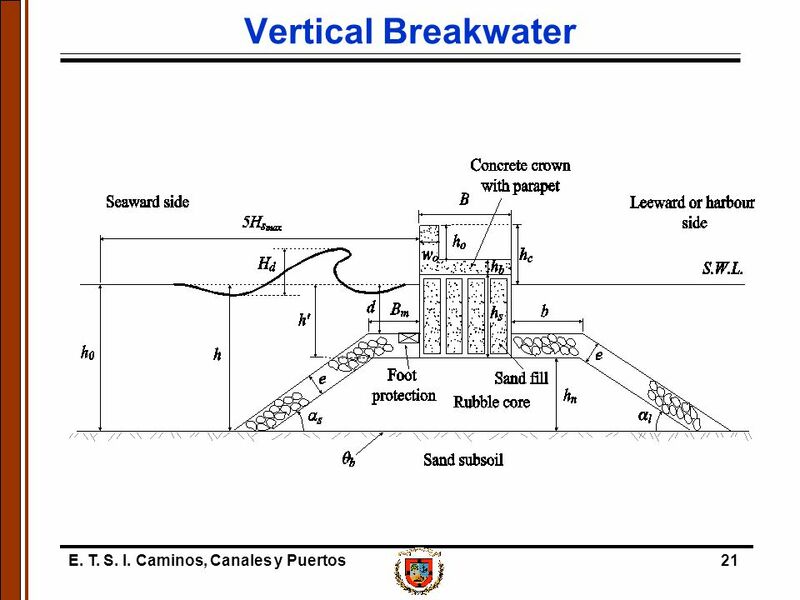 3 E. T. S. I. Caminos, Canales y Puertos3 Introduction ENGCOMP Course outline 0. Spreadsheets (Excel) and MATLAB. 1. Approximation, errors, and precision; introduction to numerical differentiation. 2. Roots of functions of one variable. 3. Simultaneous linear equations: - tri-diagonal, LU decomposition, iterative solutions; - norms, condition number, operation counting. 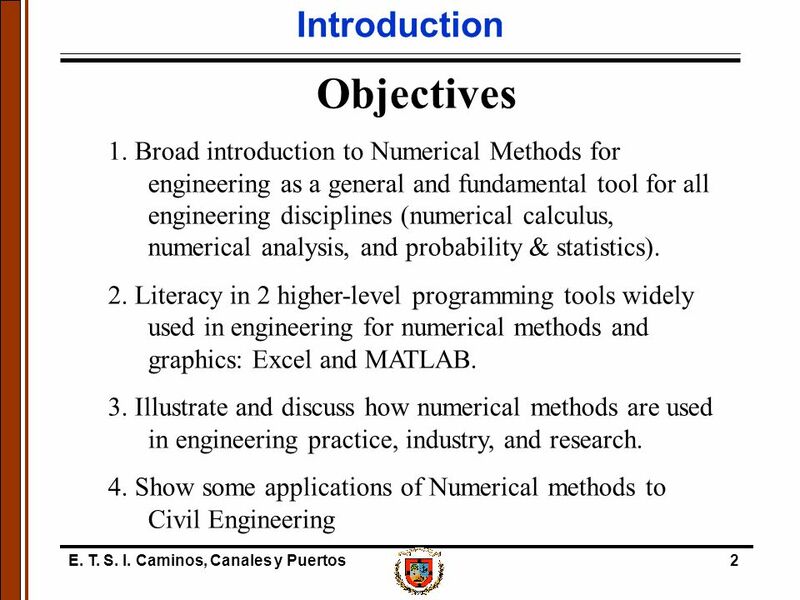 4.Introductory probability & statistics 5. Curve-fitting, regression, and cubic splines. 6. Numerical integration and differentiation. 7. Numerical solution of ODE’s. 8. 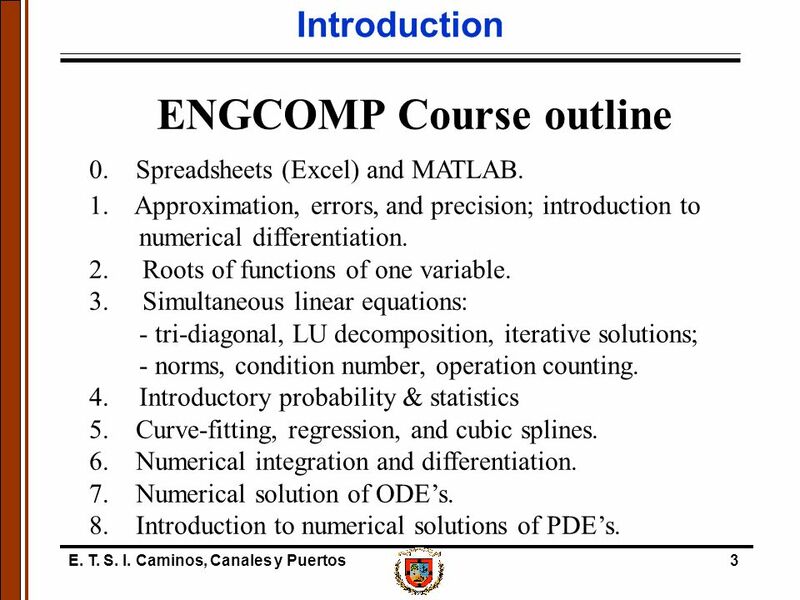 Introduction to numerical solutions of PDE’s. 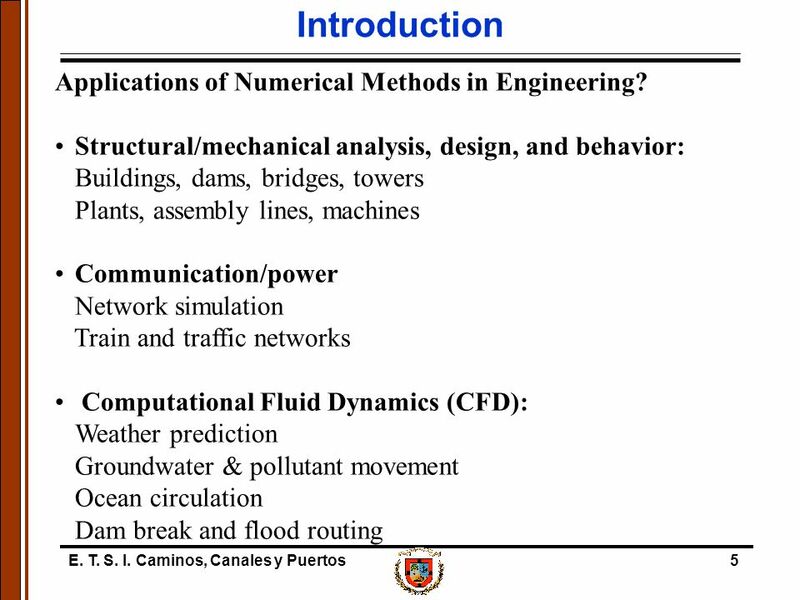 4 E. T. S. I. Caminos, Canales y Puertos4 Introduction Why are Numerical Methods so widely used in Engineering? 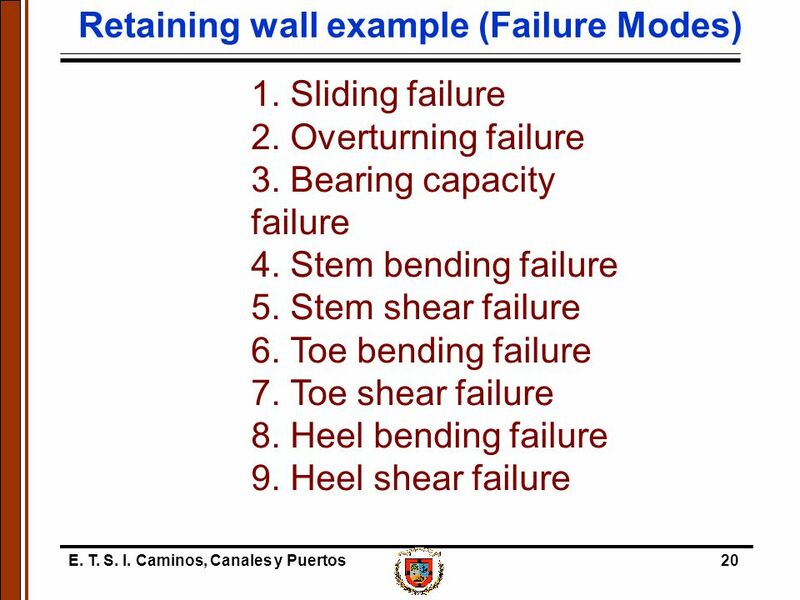  Engineers use mathematical modeling (equations and data) to describe and predict behavior of systems.  Closed-form (analytical) solutions are only possible and complete for simple problems (geometry, properties, etc.).  Digital computers are widely available, powerful, and cheap.  Powerful software packages are available (special or general purpose). 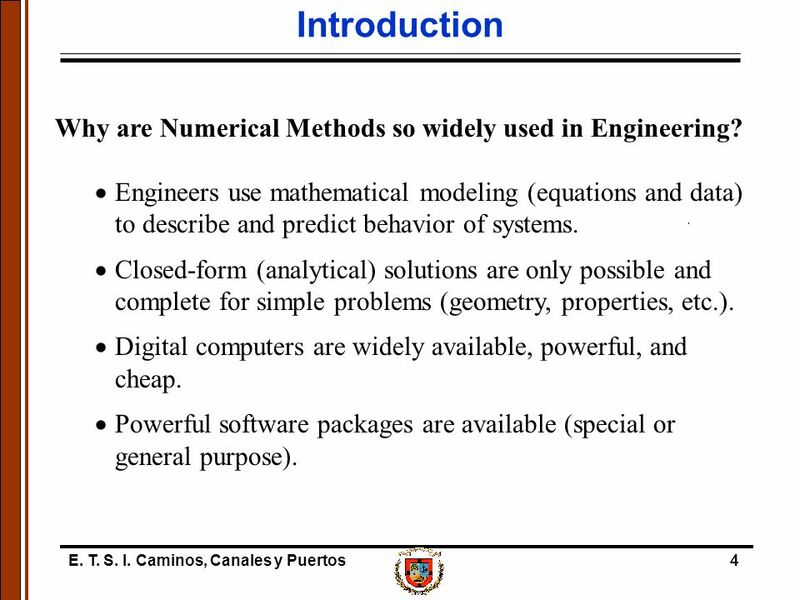 6 E. T. S. I. Caminos, Canales y Puertos6 Introduction Why study Numerical Methods? 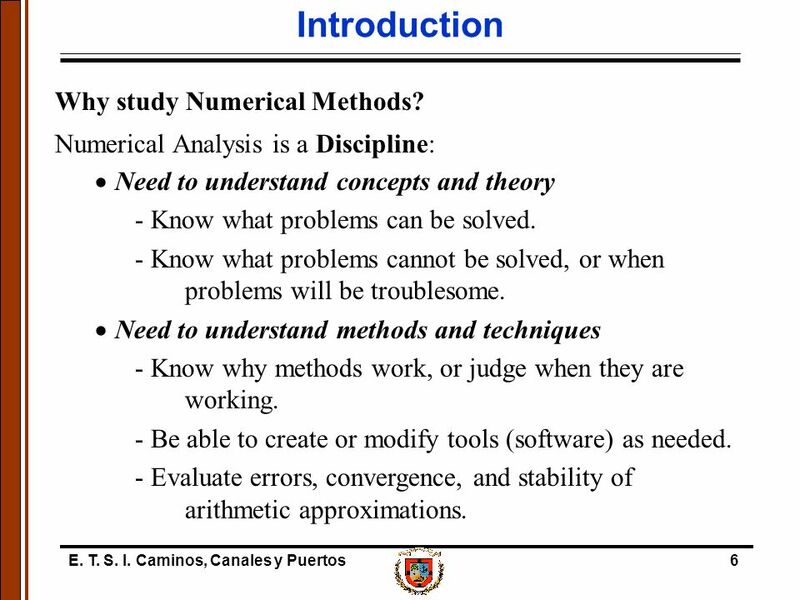 Numerical Analysis is a Discipline:  Need to understand concepts and theory - Know what problems can be solved. - Know what problems cannot be solved, or when problems will be troublesome.  Need to understand methods and techniques - Know why methods work, or judge when they are working. - Be able to create or modify tools (software) as needed. - Evaluate errors, convergence, and stability of arithmetic approximations. 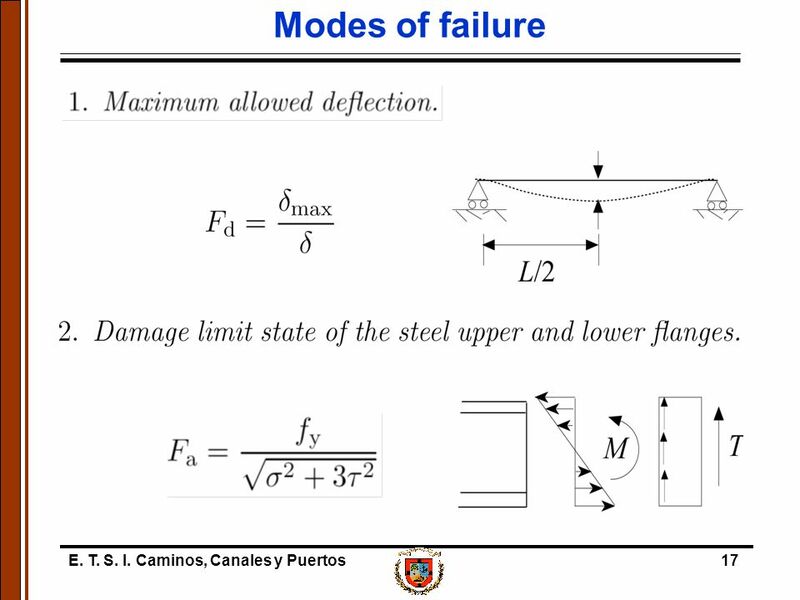 7 E. T. S. I. Caminos, Canales y Puertos7 Introduction Why study Numerical Methods? 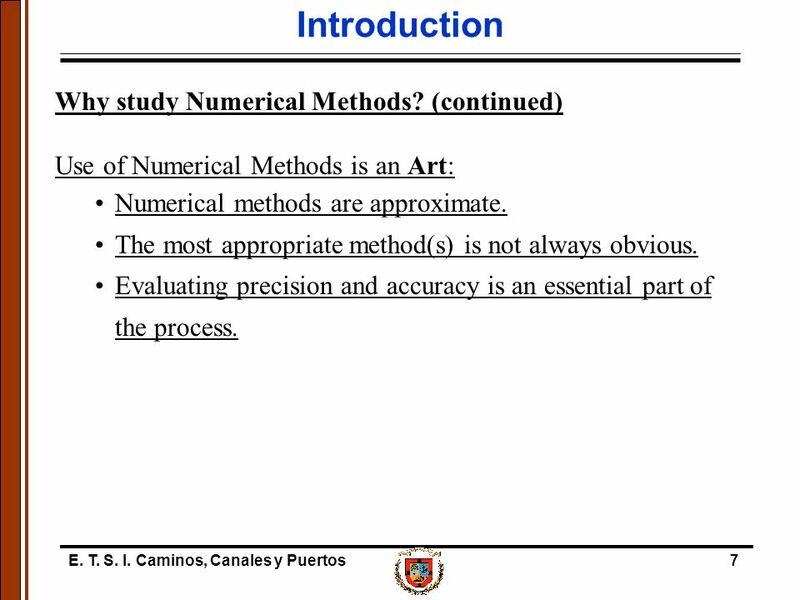 (continued) Use of Numerical Methods is an Art: Numerical methods are approximate. The most appropriate method(s) is not always obvious. Evaluating precision and accuracy is an essential part of the process. 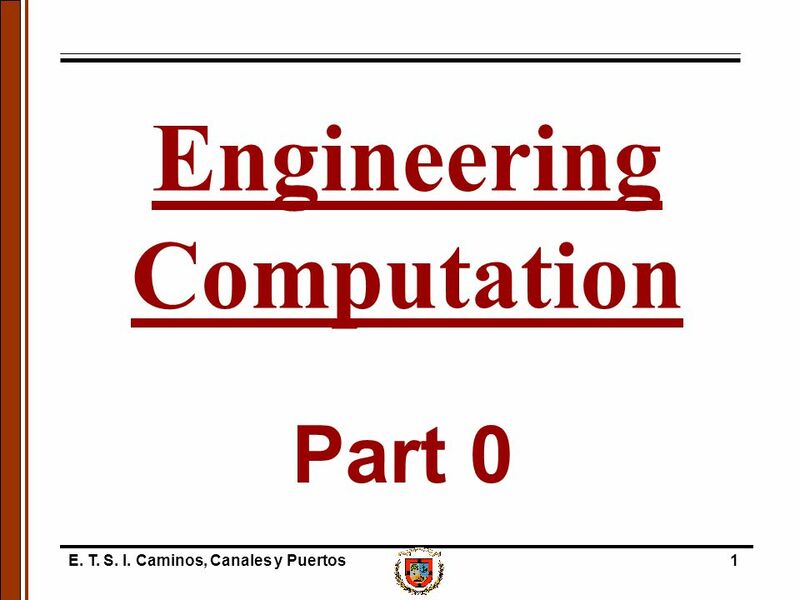 10 E. T. S. I. Caminos, Canales y Puertos10 Introduction ENGCOMP Course Materials Required Textbook and Notes: Chapra & Canale, Numerical Methods for Engineers, 4th Ed., 2002 Recommended Texts: Palm, Introduction to MATLAB for Engineers. The MathWorks, The Student Edition of MATLAB. Pratap, Getting Started with MATLAB. Kuncicky, Introduction to EXCEL. 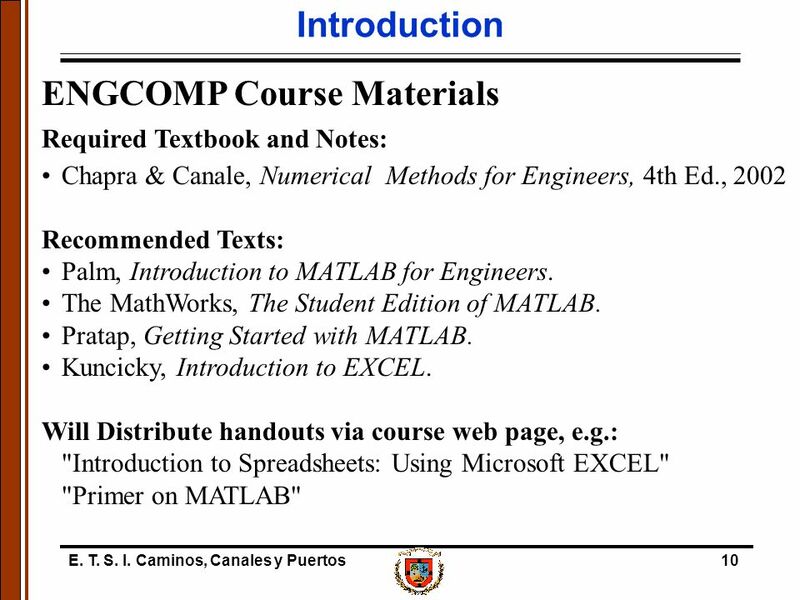 Will Distribute handouts via course web page, e.g. 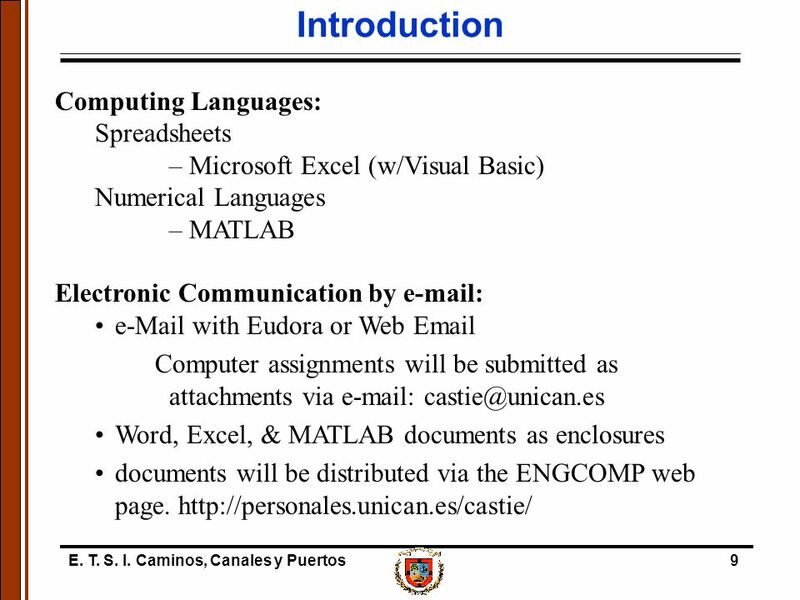 : "Introduction to Spreadsheets: Using Microsoft EXCEL" "Primer on MATLAB"
11 E. T. S. I. Caminos, Canales y Puertos11 Bibliography –Chapra S. C., Canale R. P., “Métodos Numéricos para Ingenieros”, Mc. Graw- Hill,1999. Tercera Edición. –Burden R. L., Raires J. D., “Análisis Numérico”. Ed. Grupo Editorial Iberoamericana,1998. Sexta Edición. 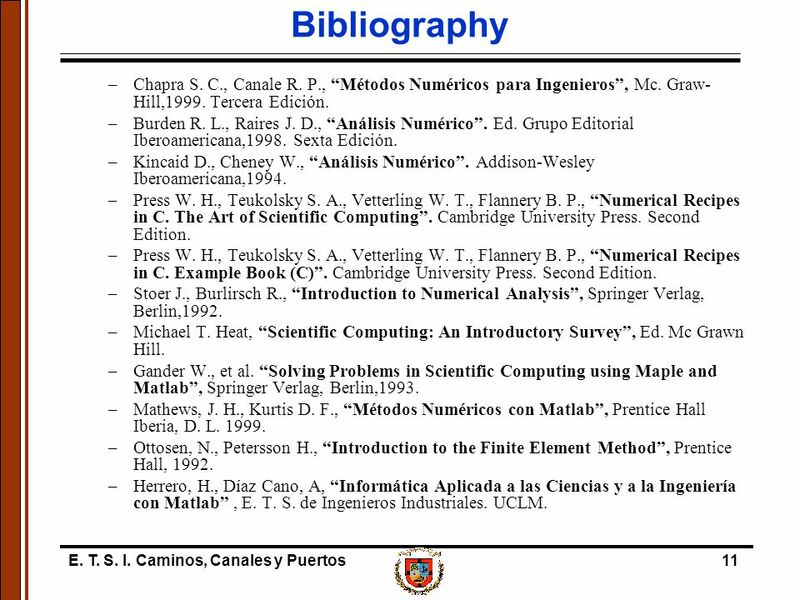 –Kincaid D., Cheney W., “Análisis Numérico”. Addison-Wesley Iberoamericana,1994. –Press W. H., Teukolsky S. A., Vetterling W. T., Flannery B. P., “Numerical Recipes in C. The Art of Scientific Computing”. Cambridge University Press. Second Edition. –Press W. H., Teukolsky S. A., Vetterling W. T., Flannery B. P., “Numerical Recipes in C. Example Book (C)”. Cambridge University Press. Second Edition. –Stoer J., Burlirsch R., “Introduction to Numerical Analysis”, Springer Verlag, Berlin,1992. –Michael T. Heat, “Scientific Computing: An Introductory Survey”, Ed. Mc Grawn Hill. –Gander W., et al. “Solving Problems in Scientific Computing using Maple and Matlab”, Springer Verlag, Berlin,1993. 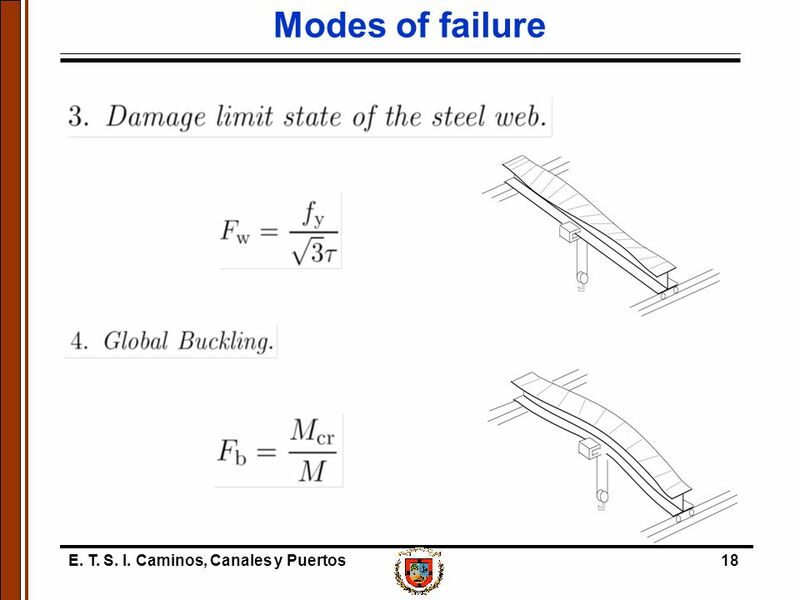 –Mathews, J. H., Kurtis D. F., “Métodos Numéricos con Matlab”, Prentice Hall Iberia, D. L. 1999. –Ottosen, N., Petersson H., “Introduction to the Finite Element Method”, Prentice Hall, 1992. 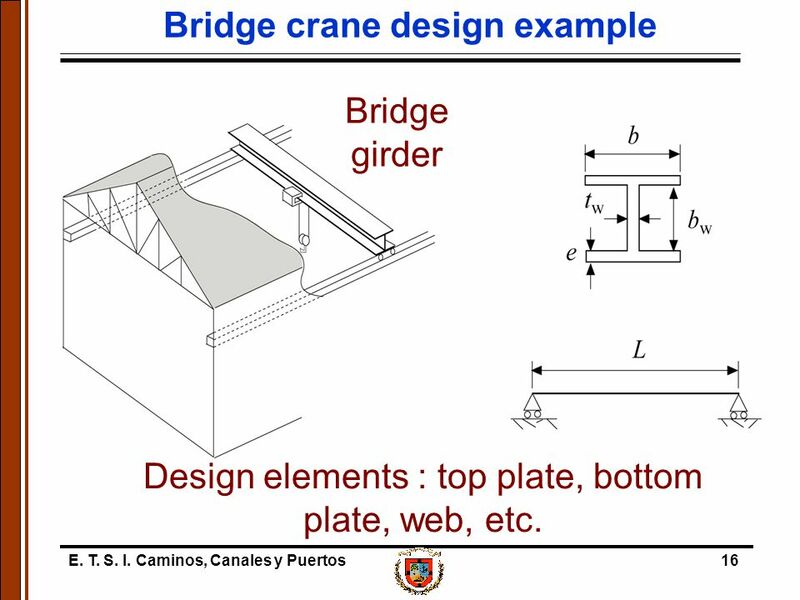 –Herrero, H., Díaz Cano, A, “Informática Aplicada a las Ciencias y a la Ingeniería con Matlab”, E. T. S. de Ingenieros Industriales. 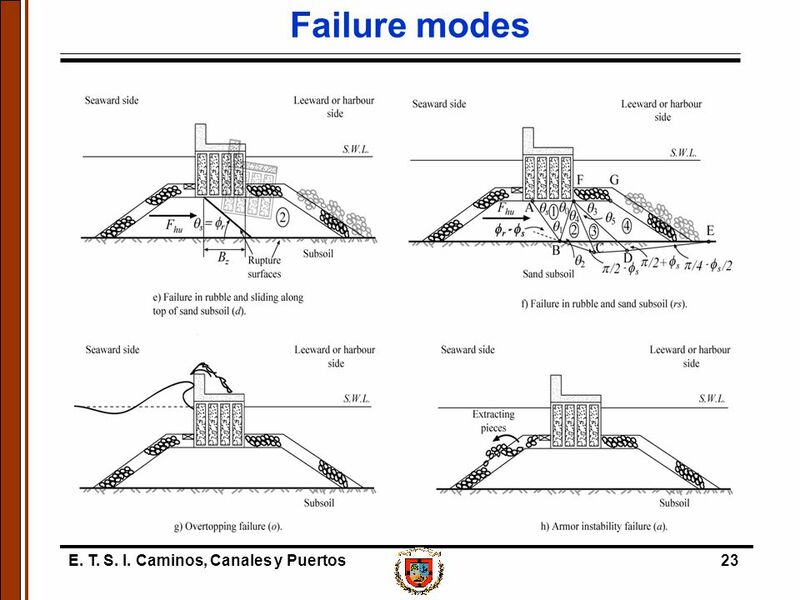 UCLM. 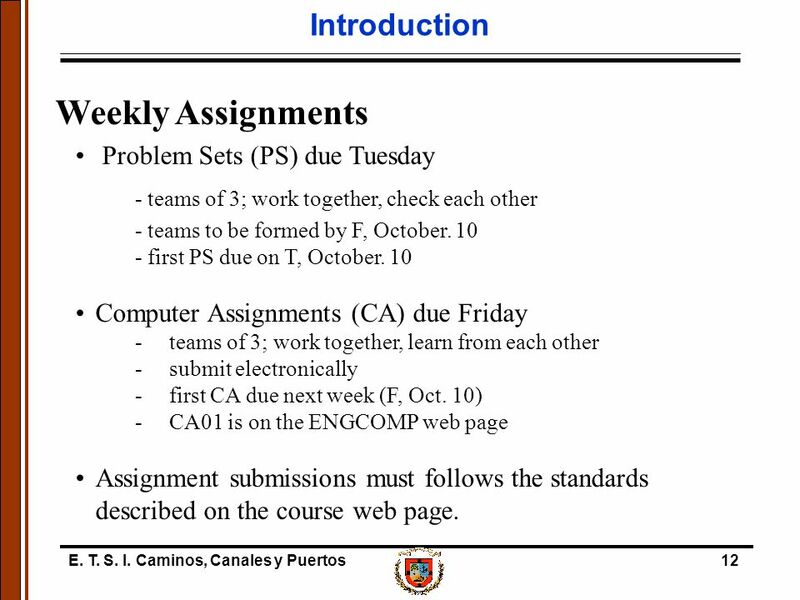 12 E. T. S. I. Caminos, Canales y Puertos12 Introduction Weekly Assignments Problem Sets (PS) due Tuesday - teams of 3; work together, check each other - teams to be formed by F, October. 10 - first PS due on T, October. 10 Computer Assignments (CA) due Friday -teams of 3; work together, learn from each other -submit electronically -first CA due next week (F, Oct. 10) -CA01 is on the ENGCOMP web page Assignment submissions must follows the standards described on the course web page. 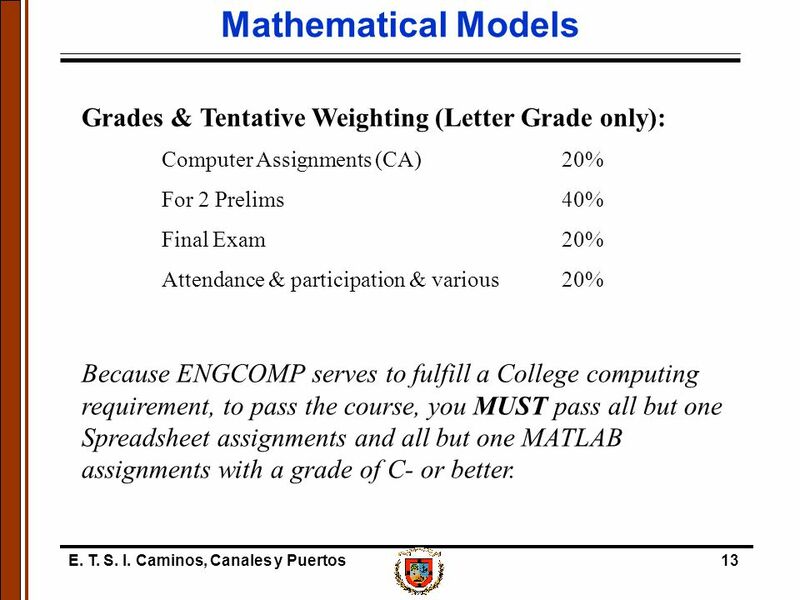 13 E. T. S. I. Caminos, Canales y Puertos13 Mathematical Models Grades & Tentative Weighting (Letter Grade only): Computer Assignments (CA)20% For 2 Prelims 40% Final Exam 20% Attendance & participation & various20% Because ENGCOMP serves to fulfill a College computing requirement, to pass the course, you MUST pass all but one Spreadsheet assignments and all but one MATLAB assignments with a grade of C- or better. 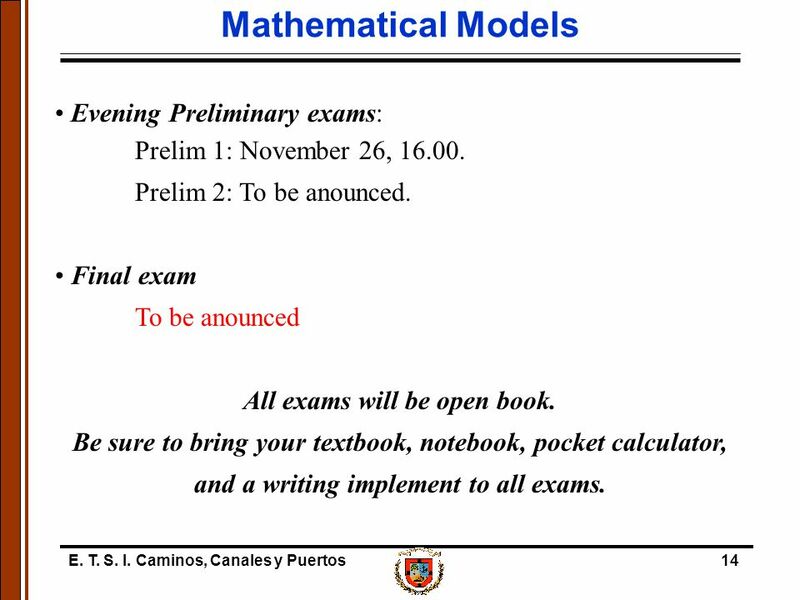 14 E. T. S. I. Caminos, Canales y Puertos14 Mathematical Models Evening Preliminary exams: Prelim 1: November 26, 16.00. Prelim 2: To be anounced. Final exam To be anounced All exams will be open book. Be sure to bring your textbook, notebook, pocket calculator, and a writing implement to all exams. 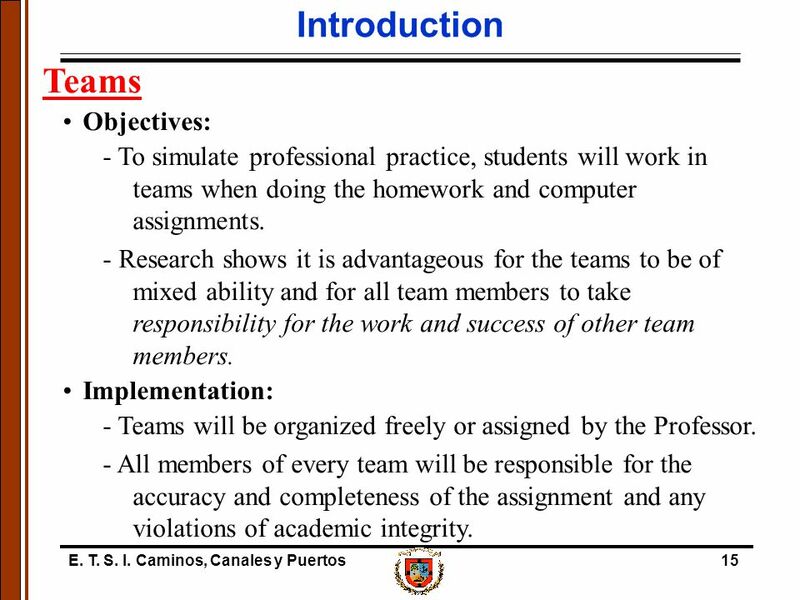 15 E. T. S. I. Caminos, Canales y Puertos15 Introduction Teams Objectives: - To simulate professional practice, students will work in teams when doing the homework and computer assignments. - Research shows it is advantageous for the teams to be of mixed ability and for all team members to take responsibility for the work and success of other team members. Implementation: - Teams will be organized freely or assigned by the Professor. - All members of every team will be responsible for the accuracy and completeness of the assignment and any violations of academic integrity. 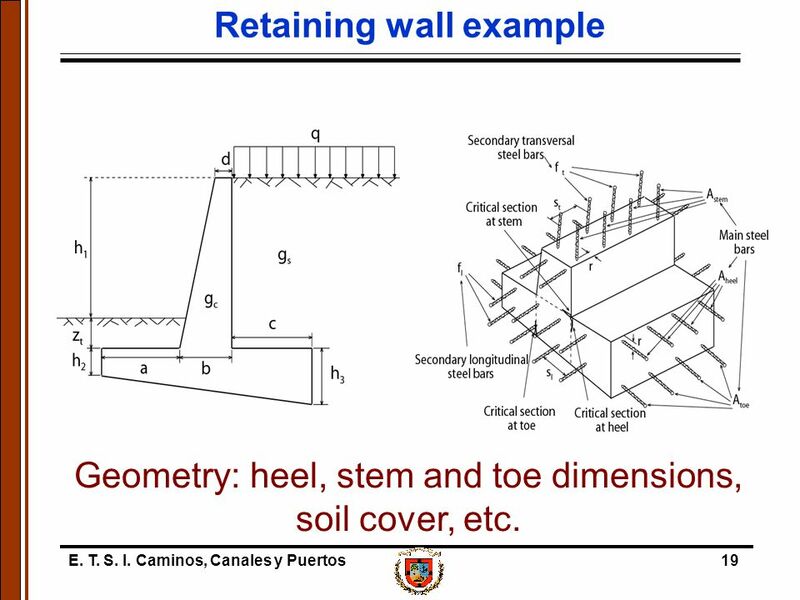 19 E. T. S. I. Caminos, Canales y Puertos19 Retaining wall example Geometry: heel, stem and toe dimensions, soil cover, etc. 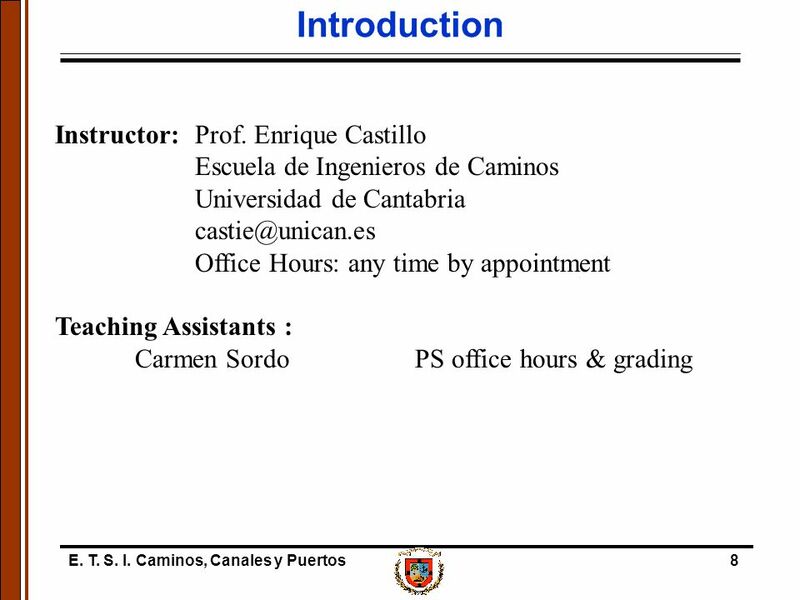 Download ppt "E. T. S. I. Caminos, Canales y Puertos1 Part 0 Engineering Computation." 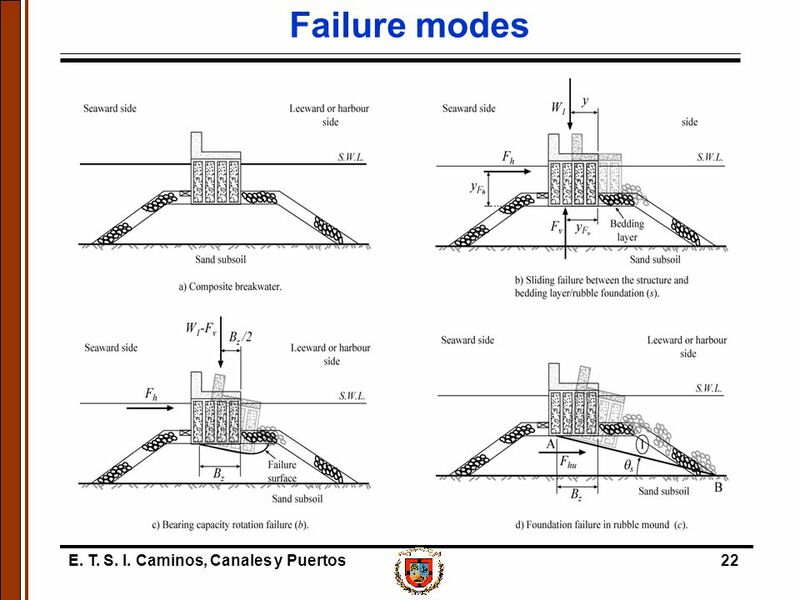 E. T. S. I. Caminos, Canales y Puertos1 Lecture 0 Engineering Computation. Computer Graphics and Animation (AT70.09) Comp. Sc. and Inf. Mgmt. Asian Institute of Technology. MATH 331: Partial Differential Equations Spring 2015. 1 Course Information Parallel Computing Fall 2008. 1 Course Information Parallel Computing Spring 2010. CS/CMPE 535 – Machine Learning Outline. CS Machine Learning (Wi ) - Asim LUMS2 Description A course on the fundamentals of machine. CS 316: Introduction to Computer Organization and Systems Programming. Statistics for Business and Economics II Stat II Dr. Shuguang Liu. MATH 330: Ordinary Differential Equations Fall 2014. PROBABILITY AND STATISTICS FOR ENGINEERS Session 1 Dr Abdelaziz Berrado MTH3301 —Fall 09. Math 174, Spring 2004 Introduction -- Desert Vista Campus -- Northwest Campus. CS 450: COMPUTER GRAPHICS COURSE AND SYLLABUS OVERVIEW SPRING 2015 DR. MICHAEL J. REALE. Topic 1: Class Logistics. Outline Class Web site Class policies Overview References Software Background Reading.